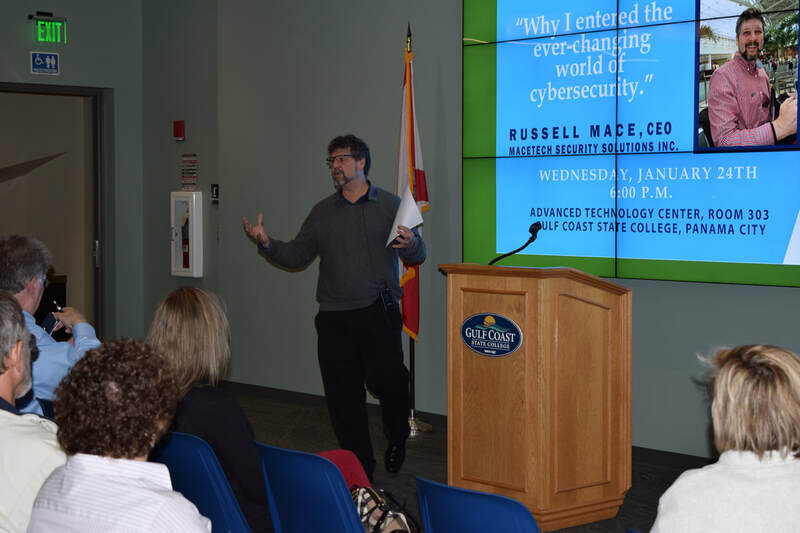 Russell Mace, CEO of Macetech Security Solutions kicked off the Enlightened Entrepreneur event sharing his adventures into the ever-changing world of cybersecurity. Over seventy students and business owners eager to learn from his journey filled the seats in the Advanced Technology Center at Gulf Coast State College. “It is important to recognize what you are good at doing, to have stability in your life, and always be honest and have integrity when starting a business,” Russell told the audience. He started his career as a civilian employee of the United States Navy and became an expert software engineer developing simulations and applications. After being temporarily laid off, the circumstances were just right to build his own company. Russell had 28 years as a defense contractor when he formed Macetech Solutions Inc. Discover more about Russell and his business at www.macetechsecurity.com.